Passengers is a movie of ideas that doesn't necessarily know how to expand on those ideas and so it ends up devolving into and relying on conventional blockbuster factors. 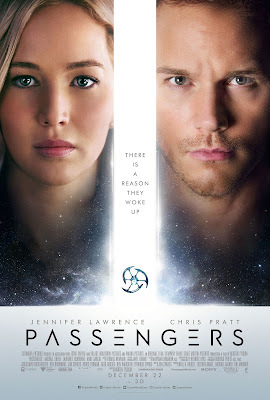 Passengers is a movie where the third act requires some amount of action and thus the reason for the inciting incident gets a pass while the personal turmoil this movie could have zeroed in on gets passed over. As viewers conditioned to the standard three act structures of most modern screenplays it is easy to see where things are headed for Passengers as soon as the McGuffin at the beginning of the film becomes the central focus rather than the conflict between what are essentially our only two characters in the film. The movie, and the script, try to justify this decision by having the resolution of that McGuffin allow a certain character to come around to what had previously caused them great strain and shock. In essence, Passengers takes the easy way out and we all know taking the easy way out more times than not is also the least rewarding route. By choosing to travel the path of least resistance screenwriter John Spaihts (Prometheus, Doctor Strange) sentences the second half of his film to that of just another in a long line of big budget Hollywood blockbusters that favors spectacle over substance. I realize that such a complaint might sound as rote as I'm describing the last act of this movie to be, but when the main idea of your film turns out to be little more than, "Don't get hung up on where you'd rather be, but make the most of where you are," and that idea is ultimately conveyed as cheesily as it sounds there's a serious issue with Hollywood's aversion to risk. One can feel the board room manipulating what might have been a more interesting or at least more complex character piece dealing in intense moral conflict being turned into an action set piece that is never really clear on the mechanics of what all it is trying to accomplish as far as making sense to the audience, but at the very least communicating that our main protagonist wasn't totally wrong in doing what he did and therefore giving him no reason to feel as bad or as conflicted as he might have would the film have not given him the best possible outcome considering the scenario. Passengers had potential, it surely did, and there is still much to admire here, but when Hollywood takes the safer route over the more challenging one it gives audiences no option but to be lazy and not the least bit surprised. 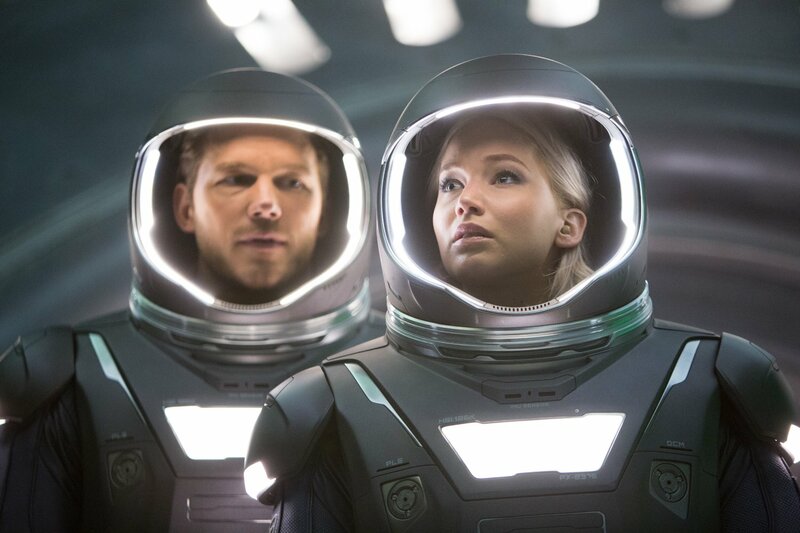 Jim Preston (Chris Pratt) and Aurora Lane (Jennifer Lawrence) find themselves lost in space. © 2016 Columbia Pictures Industries, Inc. All Rights Reserved. **ALL IMAGES ARE PROPERTY OF SONY PICTURES ENTERTAINMENT INC. The set-up is the best thing Passengers has going for it. We are dropped into space without any hint of opening credits or buffer-only an elegant title card as the Starship Avalon, a spacecraft traveling to a distant colony, floats through space at speeds the visual undoubtedly doesn't do justice. The picture is elegant though-the countless clusters of stars and unexplored galaxies creating swirls of light colors and inspiring ethereal thoughts. All seems to be as intended upon the ship-each of its five thousand passengers and two hundred and fifty-eight crew members asleep in their chambers. Being thirty years into a one hundred and twenty year journey every soul on board is meant to stay in this stasis up until a few months prior to the Avalon reaching its destination called Homestead II where humans will be able to start anew. The film doesn't go into much detail around exactly how far into the future this is though clearly there have been certain advancements to the point we assume it's over a century from now and beyond the cliff notes facts of Earth becoming overcrowded and over-expensive there isn't anything in the way of an Armageddon happening, but more the fact Homestead II simply offers a new option if you can afford it. It is when this highly stylized and highly advanced spacecraft runs into a meteor field that plans are disrupted and things begin to unfold that were never intended. Coming into contact with an object larger than it was prepared to handle on autopilot the ship takes on a fair amount of damage inadvertently causing a power outage or short that for one reason or another only effects a single passenger. Waking from what he believes to be a one hundred and twenty year slumber Jim Preston (Chris Pratt) comes to quickly realize he is the only one awake on the ship. He goes through the routine of trying to figure out what went wrong very much in the same vein any one in that position would. The film does well to answer any questions viewers might come up with were they in the situation themselves and in the meantime does a rather exceptional job of relaying the functionality of the ship, breathing life into the atmosphere that will contain the entirety of the story. Of course, if you've seen the trailers/posters/anything concerning Passengers you know Preston isn't alone for long and that Aurora Lane (Jennifer Lawrence) is also awoken ninety years too soon. What the marketing material doesn't tell you is that *SPOILER* Pratt's character intentionally wakes up Lawrence's character. Though some may consider this a spoiler this felt like an inevitability considering the likelihood of such happening and the obvious factor there had to be more to the story. Much like with Collateral Beauty I'm not typically one for spoiling movies in reviews, but when such spoilers are plot points in which the basis of the movie hinges on and need to be known in order to discuss both the highlights and downfalls of what the movie does/does not accomplish it's impossible to avoid certain elements. The marketing certainly suggested there was something deeper, maybe even more vile to the premise it promoted of two attractive stars being stranded in space together and so I don't know that divulging such a detail will really change one's outlook or expectations were they going to see the film based on what they saw in the advertisements. That this plot point also occurs within the first act makes it less the main dramatic beat of the film and thus leaves room for more fertile ground to be explored in the second half of the film before things go from contained character drama in space to full on action movie. All of that said, the first hour of this thing is paced pretty perfectly. As mentioned before, the way in which Spaihts' screenplay and director Morten Tyldum (The Imitation Game) stage the premise is genuinely engaging in that we become immersed in this world of the Avalon. 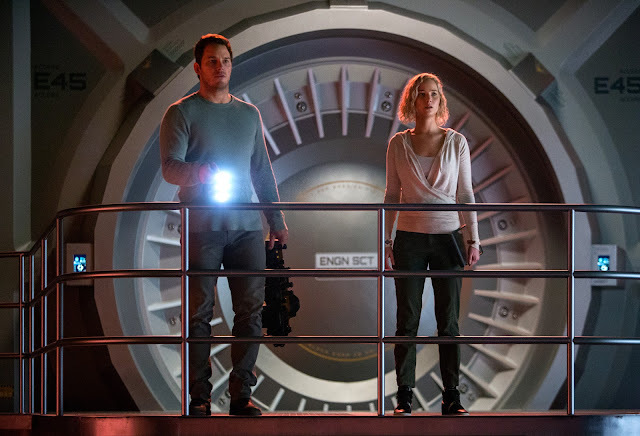 The production design is as flawless and sleek as one might expect a futuristic sci-fi film on a $110 million budget to look and most of the quirks and creativity in the film comes from the neat things passengers can do aboard the craft. Whether it be the way in which it relegates interstellar space travel to something of a normality or a swimming pool that, when dropped into zero gravity, can form bubbles of water around beings that present a cool visual if not an entirely necessary one. Passengers is also one of those movies that takes advantage of the fact it has two of the biggest stars on the planet walking around within it and throwing as much charm at the camera as they can. Is there a need for Lane to visit the swimming pool in her chic white swimsuit as often as she does? Of course not, but as it's Lawrence in a chic bathing suit the thought is it alone will be enough to sell tickets to the male demographic. Is it necessary to have multiple shots of Pratt's derrière as he takes a shower or wanders through the barren halls of the Avalon? Of course not (though it does make some sort of sense given he's by himself on this huge spaceship), but the thought is it alone will be enough to sell tickets to the female demographic. If as much is transparent from the trailers alone though, then go for Michael Sheen's android named Arthur who is the one consistently reliable source of intrigue on both the Avalon and in the film. Preston and Lane are forced to go to extreme measures in order to stay alive aboard the starship Avalon. As it turns out, this is very much Pratt's movie to carry with Lawrence serving more in a supporting role, but nonetheless both stars are giving it their damnedest. The chemistry is naturally the key and as they've displayed in movies before both Pratt and Lawrence have enough charisma to fill the entire Avalon two times over; Pratt showing something of a side we haven't seen when within the first half hour he is reduced to genuine desperation. Of course, as this montage of Pratt's Preston attempting to fill his time with "Dance Dance Revolution," playing basketball, and breaking into the command deck is undercut by Elvis Presley's "A Little Less Conversation," it seems the film itself doesn't quite trust its star. As for Lawrence, she is tasked with the role of having to both be a victim and an equal to the conflicted and seemingly disagreeable Preston. The best aspects of Lawrence's performance come from always being aware and making present that no matter the distraction-it only serves for so long before the reality of their situation rears its head. We understand the conflict presented to Preston and may even have made the same choice he does were we in his situation, but that doesn't make the implications of it any less nauseating. This is the grey area in which the film might have otherwise prospered and become something truly engaging, but if this is indeed the ending Spaihts originally wrote then it seems there was never any concrete direction as to where to take this kernel of a fascinating idea. And as said before, the first hour unravels the story beats, characterizations, and arcs that are hinted at in a fashion where everything feels organic as if building to a pure euphoria just as it becomes clear all is about to come crashing down. As the inevitable does begin to happen and the last fifty minutes begins to devolve into those aforementioned conventions the film also loses any semblance of what might have made it riveting or more substantial. Rather than furthering its discussions on love, betrayal, humanity, or the guilt of having to live with some morally reprehensible actions or having to live without anything at all the film ignores such ripe facets in favor of explosions in space. Though Passengers may come to be enough to satisfy the masses with its expensive set design, pretty actors, and cool visuals it will leave their memory as quick as it enters making the real offense of the film not what Pratt's character decides to do, but the potential it ultimately spoils.